I am very grateful to God for giving me the gift of music almost over 40 years ago. 31 years ago I accepted the Lord Jesus as my personal savior. My 1st year of salvation was a very challenging musical transformation from Secular music to Gospel / Christian music. During that time The Lord did a purifying work in my musical taste, which is still in effect until this day. I have been involved in the music business about 14 years. Within that amount of time I have seen a decline in the sacredness in some of today’s gospel music. I have seen the attitudes of some musicians and vocalist leave a bad impression; to the point that it is embarrassing to admit that they are a part of someone’s church. I believe the Devil fights the music departments of the church so hard because he knows the life altering power that is in music. When it is coupled with the life giving Word of God it carries life changing, explosive power! So it is part of his goal is to distract, distort and dismember the weakest members in church music departments. Let me make this clear! The type of weakness that I’m talking about is not physical, but spiritual! Now, be aware of this, The Devil, most times won’t come to someone directly, but will dangle a carrot (your own desire before God’s time for you to have it), in front of the person that doesn’t have the faith or is too weak to resist their own fleshly desires to wait for God. The allure and hunger for fame and fortune has distorted some of our gifted musicians and vocalist to the point that they can’t see much else. As I stated before, being a part of the Music industry, I understand some of the goals that are to be reached and I am doing my best to reach them. But at the same time I must, we must, keep in mind, if we are doing Gospel / Christian Music that our main goal must be to glorify and lift up the lifestyle and message of Jesus Christ! In the following paragraphs we are going to take a closer look at two words…. “SACRIFICE” and “PRAISE”. The idea of this definition is offer a worthy gift that is very important, valuable and meaningful from the giver, to God. The most important thing that we have is our lives and everything that is a part of it. Such as…our talents, our wills, our bodies, our money, yes, everything!!! This is done in stages and under the guidance of God’s word and Holy Ghost. Therefore it is a living, day by day, sacrifice. 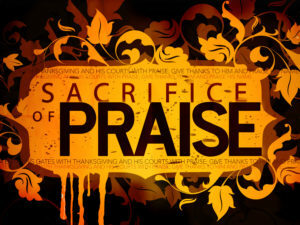 PRAISE: the expression of approval or admiration for someone or something. When you are on a team that is in stiff competition with another team, if you are really for your team, you will cheer for them. If they score points you will cheer, maybe even jump, scream or even run to show your support for the team you want to win. This is the meaning of Praise! Because one is on God’s team, they WILL EXPRESS the admiration for the things of God and WILL EXPRESS approval when God is doing something for one’s self and for someone else on the same team! In some cases there are people that have very little, to no loyalty to any team. They will just go with what is easiest to them. They do not want suffer with team mates during a work out session, they are not willing to bare the shame of a loss, they do not want to enduring the correction that the coach may give, they only want to share in the celebrations of victory. The bottom line is they are looking out for their own best interest. They may wear your uniform but will be easily willing to work for the other team if promised a better deal. This is some of what is happening in some church music departments and with some Gospel / Christian Music Industry Artist. In some situations, I think people have been tricked into playing both side and in other case people have been choked out with the cares and allures of this world. But what ever the case, here are a few pointers that can be used to help us recognize who’s on what team! As members of the winning team, (the Body of Christ), it is very important to be clearly identified as a member of this team. Without proper identification one could be misidentified with direr consequences. When it comes to being a Christian, the identification marks or uniform, (Fruit of the Spirit), should be easy to recognize. Their lifestyle will display what team or side the person is on. When the heart of a person is in right standing with God, and keeps him or herself away from ungodly influences, then the inspiration of God will begin to freely flow. Vocalist will sing with the anointing, musicians will play under the anointing and song writers will write songs that will strengthen the Saints, restore the backslider and save the lost! Usually, something as simple as a uniform or a secret password would be enough to identify which team or side you belong to, but there are people who say they are Christians but they don’t act like it. They don’t display the team identifying marks. The Bible warns us that we must be able to identify our true team members from those that are just playing the part. If not, it will have a devastating affect on the weakest team member and in the long run, on the entire team. If this person is led by their flesh and moves out of the will of God, then they become a part of the team that they once stood against. At this point, the deceived musicians and vocalist begin to fit the profile of a double agent. Talking in the Christian language but living like a wolf in sheep’s clothing. It is very important they we, Musicians and Vocalist, stay in God’s Word. It will make it much easier to identify imposters. It doesn’t matter how good they can play, sing or preach. If their actions display otherwise, then you must act accordingly before the influence spreads. Believe me, it will spread! It is very important that we have our minds fixed and settled on correct way to offer our gifts of music to God. No matter if we are in the church music department or on top of the Gospel / Christian Music Industry. We first, must keep in mind, who we offering our gifts to. We keep in mind, how great and awesome He is! We must also keep in mind, how worthy He is to receive our best music and vocal offering. When we reading and study God’s Word constantly, all these concepts and truth will stay in the fore front of our minds. All this must be locked into our hearts and minds even before we play the first note of sing the first word. (COLOSSIANS 3:16…Let the word of Christ richly dwell within you, with all wisdom teaching and admonishing one another with psalms and hymns and spiritual songs, singing with thankfulness in your hearts to God. At this point, we now have the right mind to offer gifts to God that He will accept. Now as we play and sing we are making an atmosphere for the presence to God come and dwell in. People can now experience the life changing, chain breaking, healing power of God in the presence of the worship service or concert. (PSMS. 100: 1-2…Make a joyful noise to the Lord, all the earth! This is a new year with new opportunities, so let’s refocus and follow the guidelines that God has given us, so that we can start this year with the righteous mind, which will surely lead to righteous actions. Then God can use the gifts and talents He gave us (no matter what it is) to fulfill His work in the earth.